This basket contains "a real bear hug". 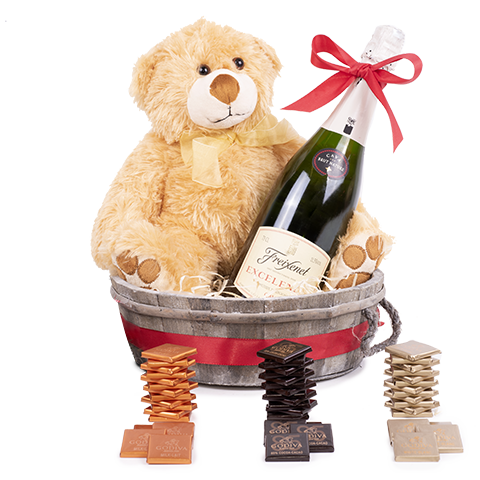 Accompanying this adorable teddy is an equally appealing selection of chocolates that anyone who has even the slightest sweet tooth will absolutely love. The 100g bag of carrés 85% cocoa dark chocolate, the 100g bag of carrés milk chocolate and the 100g bag of carrés white chocolate form a trio of taste, sweetness and delight, all made by Godiva. The 75cl bottle of cava we’ve chosen is an Excelencia Brut, from the Freixenet vineyard, a guarantee of quality and class. On receiving this basket, the first thing they’ll notice is the loving look the teddy bear gives them, with its yellow ribbon it’s ready to melt any heart. They’ll then find the chocolate, which goes really well with the bottle of select and very bubbly cava, from the famous Freixenet vineyard.